Where did you intern? 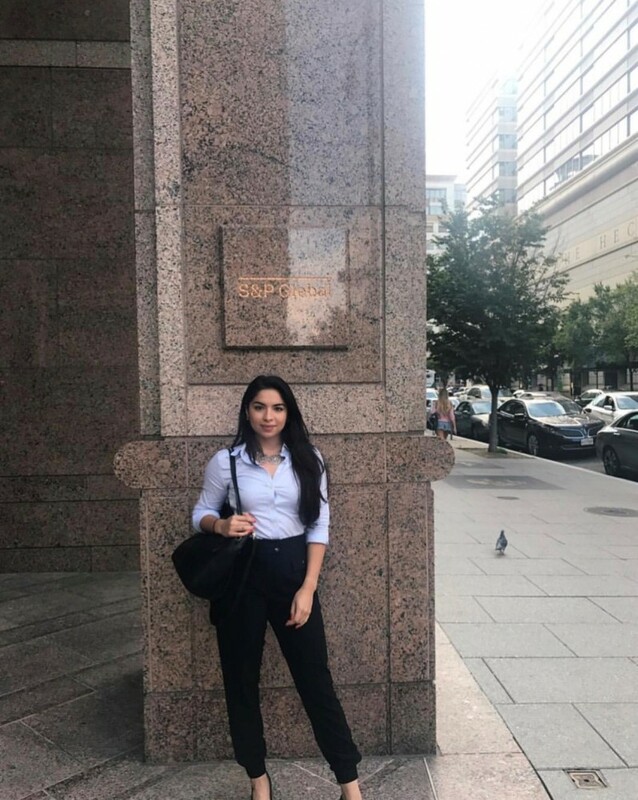 This past summer, I interned in Washington, D.C., for a company called S&P Global, formerly known as McGraw Hill Inc. Its primary areas of business are financial information and analytics. It’s also the majority owner of the S&P Dow Jones Indices joint venture. What did you do there? I was the social media intern. As S&P is a global company, my direct boss, the director of social media, was stationed in London. I helped with keeping the social media metric charts updated on a weekly basis, and I helped my boss with posting content on Instagram. I also researched the company’s social media channels and found better ways to reach a more global audience. I was able to go out into the field and take pictures and video of different events including Senate hearings. How did you get your internship? I applied to The Washington Center, which is a program that accepts students from around the world who are looking to gain internship experience as well as to challenge themselves. After getting accepted into the center, they sent out my resume to company’s offering internships that best suited my interests. What projects did you work on? I met many influential people, including Senator Blanche Lincoln, who taught me what it means to be a strong and persistent woman. Through the Washington Center, I spoke with pioneers in the field of journalism, including John Speer who is a newscaster at NPR. How did your internship connect back to your coursework? It taught me more how to be in a professional environment. Also, the field of journalism is extremely competitive but my experience in D.C. gave me insight into other ways to reach my goals. What was the coolest thing that happened during your internship? I attended the Sandy Hook Gala where many influential people in the country were in attendance. I also got to meet and take a picture with Tennessee Senators Bob Corker and Lamar Alexander. I attended many Senate hearings and that was cool because I got to see a lot of people I see on TV in real life. What did you like most about your experience? I loved living in Washington, D.C. It’s such a beautiful city with lots of culture. It felt great living in a city that contains so much history and is so important to America. What did you learn about yourself? I learned that it takes a lot of hard work to get where you want. All of the senators and business people I met worked tirelessly to get where they are now. Nothing worth having comes easy. Also, I feel that I gained a sense of maturity and reassurance in myself. I now know more of the steps necessary for me to reach my goals. Most importantly though, I learned that I am well equipped to make it out there in the real world and that I should start trusting myself more. I have a newfound sense of confidence for myself because of this whole experience. Also, I learned how important it is to get out of your comfort zone because that’s where you learn what you’re really made of. How did the position increase your professional confidence? The Washington Center was instrumental in molding and teaching me the importance of networking. I now feel like I have a lot more to bring to the table, experience-wise, and I feel more confident in my skills. Also, I was able to experience working in a big company like S&P Global, where I was able to see first-hand what it takes to make it. How did it help you prove yourself in the “real-world?” It was an eye-opener. I have lived in Miami my whole life, so moving to another state was rough. But it showed me how there are so many opportunities outside of Miami just waiting to be taken by someone who really wants it. What advice do you have for those beginning the internship process? Don’t get discouraged if you don’t get the internship you wanted. Apply to everything that pertains to your field because you never know what you will get. I never thought in a million years I’d have such a great internship and be able to move to D.C. You just have to have an open mind and just do it.